On these U.S. shores a devotion to the Mother of God under the title of Our Lady of Monte Vergine is unknown by most people. There are, however, those of us who know Italy and the presence of the Benedictine abbey on Monte Vergine that inspires us to use this title to Mary. From the image herewith it is difficult to grasp that the icon is quite large, with a height of over 12 feet and width of over 6 feet; it shows the Mary seated on a throne with the Infant Jesus seated on her lap. 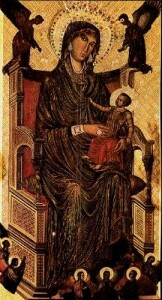 Historians call icon of the Mother and Child, “of Constantinople” (because it is said to have been brought to Italy by King Baldwin of Jerusalem) given to the Benedictine monks in 1310. King Baldwin. The image is dark, so the icon is often referred to as one of the “Black Madonnas”; a title given to several images of the Holy Virgin Mother. The famous Benedictine sanctuary located in the village of Montevergine (of Campanian region of Italy); the “Monte Vergine” comes from the religious history going back to the pre-Christian era when there was a temple of Cybele existed. A chapel of the Blessed Virgin was built in the seventh century. In 1119, Saint William of Vercelli founded the monastery that still exists. Saint William was a hermit who came back to his native Italy after making a pilgrimage to the shrine of Santiago de Compostela (Spain). Saint William had the reputation for sanctity inspiring many to live in cells on the mountain. Monasticism still is present there. The first true church was constructed in 1126, and was dedicated to the Blessed Virgin. Today, it is reported that over one-and-one-half million pilgrims yearly pay homage to Our Lady of Montevergine. The most popular day is Pentecost. There have been numerous miracles attributed to this portrait of the Mother of God and her Divine Son. 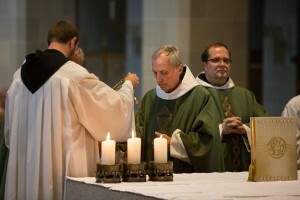 The Abbot Primate of the Benedictine Confederation celebrates his 75th birthday. 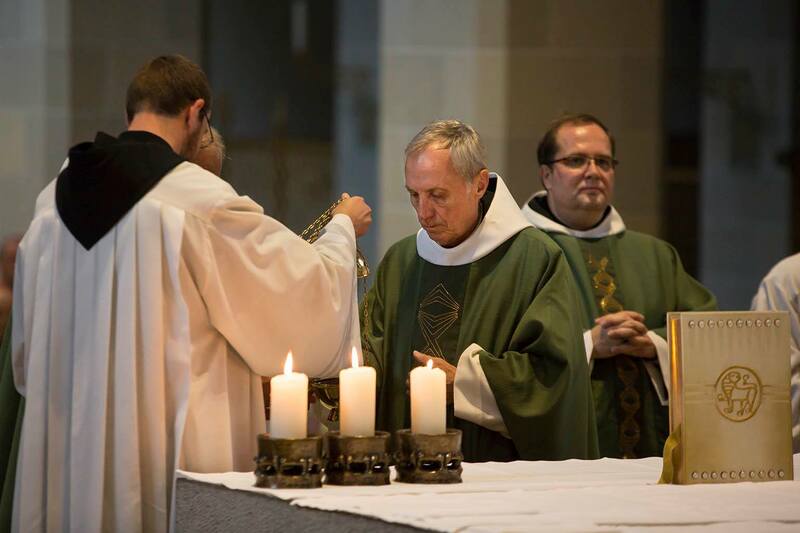 Abbot Notker Wolf presides in charity over the worldwide communion of Benedictines from the Aventine Hill in Rome. He was the archabbot of the St Ottilien Abbey and Congregation before his election as Primas. Today, began a new transition in the life of the Benedictine community of the Abbey of Regina Laudis with the election of Reverend Mother Lucia Kuppens as the Third Abbess. The new abbess succeeds Mother Abbess David Serna. An announcement is made here. The Most Reverend Leonard Paul Blair, STD, Archbishop of Hartford, offered Mass and presided over the election. Mother Lucia, a Boston native, is a 1973 graduate of Connecticut College and she earned a PhD from Yale in English Literature having written a dissertation on Shakespeare’s portrayal of male and female relationships in a process of dis-integration. she entered the Abbey in 1979. Of recent time, Mother Lucia has been the community’s cellarer and the project manager of the abbey’s renovation and expansion project. Blessings to Mother Lucia and the Benedictine nuns. The idea of sharing anew the beautiful, the true and the good of the Catholic faith with baptized Catholics, with other Christians, and with those justing seeking Someone greater, is popular these days. The words we are using to describe this sharing of faith is the new evangelization. Saint John Paul got the ball rolling again after a hiatus from the time of Blessed Paul VI and the Fathers of the Second Vatican Council with promoting a new way of bring the Lord’s Good News to society again. But for him the new evangelization isn’t about a program as much as it is manner of conversion. As typical, we see the use of the word “evangelization” used in a variety of ways but without a distinct and concrete definition. In my estimation few have really grasped the concept of it means to be engaged in evangelization. So many want to bolster the numbers of people in the pews, or get parish programs going or some such thing superficial thing. The difficult task is forming in a new way invested Catholics. There are times you get the sense that the “same-old” is being repackaged: it is new wine in old wine skins. The new evangelization becomes in many places more of the ghetto mentality and a perpetuation of an immature Christianity. That’s a long way of saying that we need a more creative approach in sharing the faith in bold ways. Certainly we don’t need gimmicks. We do, however, need an honest approach that is human connected to the divine. 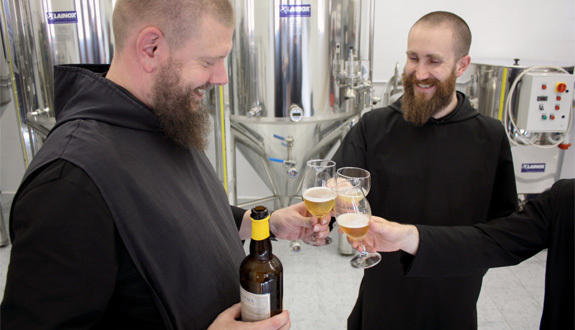 The Benedictine monks are getting to the heart of what I am aiming at with the new evangelization: beer brewing for the Kingdom of God. Indeed, the brewing of beer (and drinking the beer) can be a de-regulated way of getting to the heart of the faith, getting to the creator and how He is manifested in His creation. Brewing and drinking beer is a very human experience that will penetrate the heart and mind to think a little more deeply about spiritual things and how to live for and with Christ. Here is an article, “Brew Evangelization.” Read this fine article and the links embedded. One of my interests is to see the Benedictine charism flower again. AND it is beginning to do just that…. 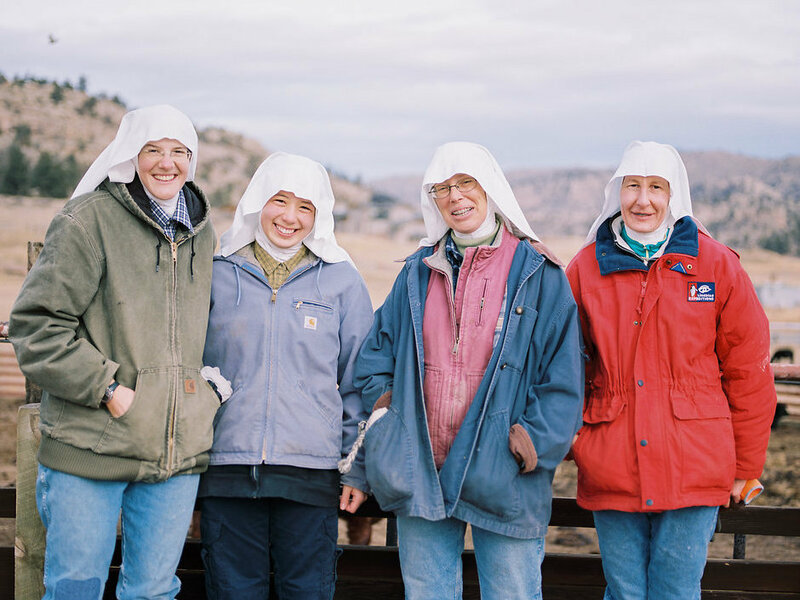 Benedictines historically live close to the land. Since the 6th century the Benedictines have also been pioneers in every field of study known to humanity. 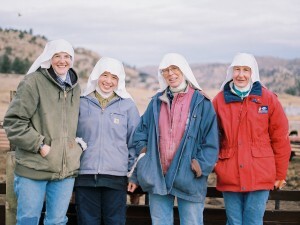 Here is a NPR story on the Benedictine nuns of the Abbey St Walburga (Virginia Dale, CO). The Benedictines of St Walburga Abbey is a faithful group of women of a variety ages, experience, education and talent. I am happy to see that they are working the land in a meaningful way.